Designer cupcakes are all the rage and presenting them in these delightful mini cake stands will elevate yours into a league of their own! 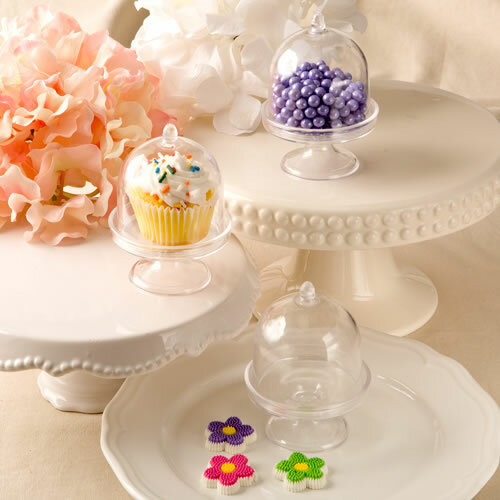 Enchant your guests with these cute mini cupcake stands. They will make an eye-catching display on your event tables. Our stands are made from clear acrylic plastic and feature a raised round base on a stand and a domed top that lifts off. Fill the stands with treats in a color that matches your table theme or use them to showcase one fabulous designer cupcake. Add a delightful touch to your tables when you adorn them with these dramatic little favors. A cute and unusual favor and a great way to showcase your designer cupcakes!